Google has announced Android Instant apps at this years developer conference and this new feature is designed to make it easier for your to try out Android apps. 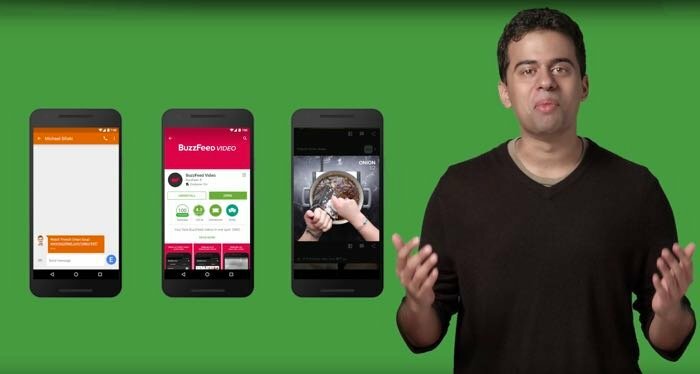 Instant Apps basically allows to to instantly access an app without having to download that app to your Android device. An evolution in app sharing and discovery, Android Instant Apps enables Android apps to run instantly, without requiring installation. Instant Apps lets you experience what you love about apps—fast and beautiful user interfaces, high performance, and great capabilities—with just a tap. Android Instant Apps lets you experience beautiful and immersive apps, with material design and smooth animations, without installing them on your device. You can find out more details about Google’s Android Instant apps over at their websiote at the link below.